Cor-Pro Systems, Inc. provides a wide variety of corrosion protection services, including many custom applications. Cor-Pro Systems’ top-of-the-line facility sets it apart from many of its competitors, enabling near-constant operation times and extremely rapid job completion schedules. Cor-Pro’s Velocity coating service is specifically geared toward rapid-response tasks. If you have a pressing deadline, Velocity is the answer to your prayers. This premium service utilizes every advantage of the Cor-Pro methodology, including multiple accuracy checks, superbly trained crew, and round-the-clock facility operation to reduce delivery schedules. We take pride in the Cor-Pro Velocity Service. The purpose and responsibility of this offering is to ensure that your urgent coating projects are processed and delivered expeditiously. We have assembled a team of Cor-Pro’s best experts to staff the Velocity Desk everyday at 11:00 AM and 2:00 PM to process any projects that require Velocity Service. Only Cor-Pro can offer you this kind of responsiveness while guaranteeing a superior level of professionalism and commitment to quality. 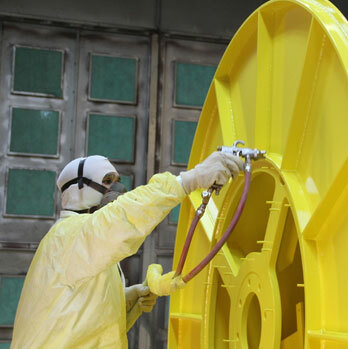 Our mission is to be the corrosion-protection specialist for critical equipment. Our purpose is to constantly raise the corrosion-protection standards through better knowledge, products and best practices.